The bungalow was built in the mid-1920s. 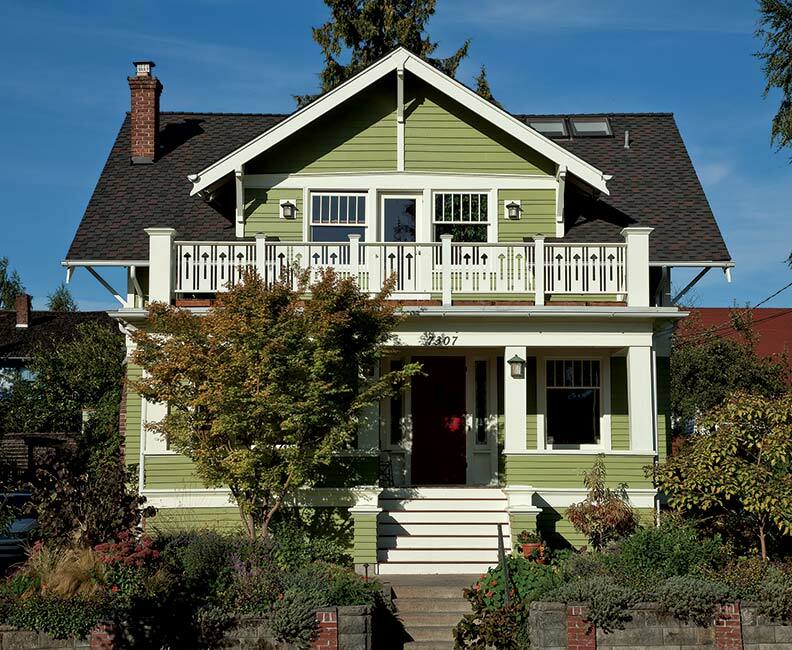 After years as a rental, Scott and Tracey McCulloch’s former Portland, Oregon, home was ready for a freshening before the couple returned to retire there. The 1400-square-foot “builder’s bungalow” had lost many of its early details, but among the few remaining elements was a stepped archway between the living and dining rooms. 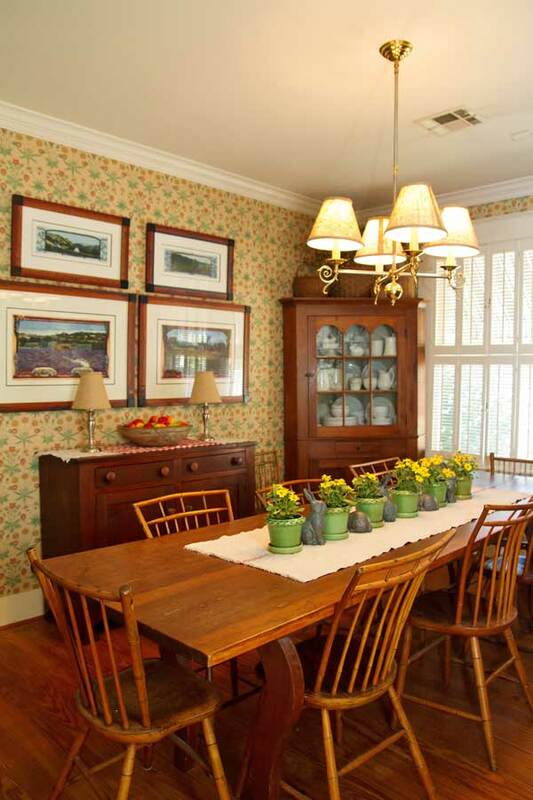 The buffet in the dining room is original to the house; a simple decorating scheme relies on wall colors in a Craftsman palette. This signature feature became the guiding element for a comprehensive renovation that not only touched every room in the house, but opened up a formerly boxy, closed-off floor plan. 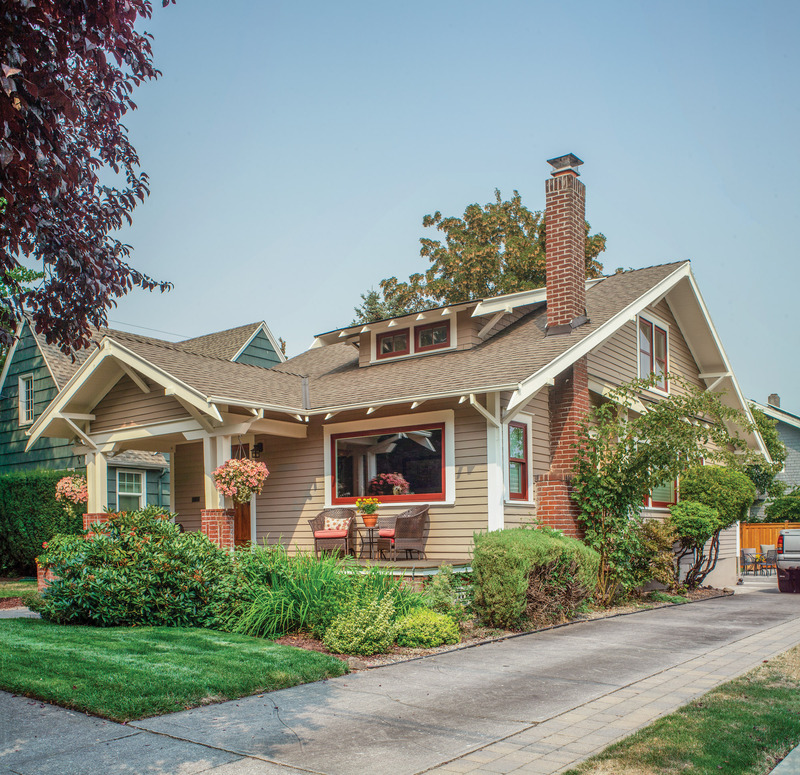 “Every bungalow of this era, if you look throughout the house, they’re split down the middle,” says designer Wade Freitag of Craftsman Design and Renovation, who managed the project. 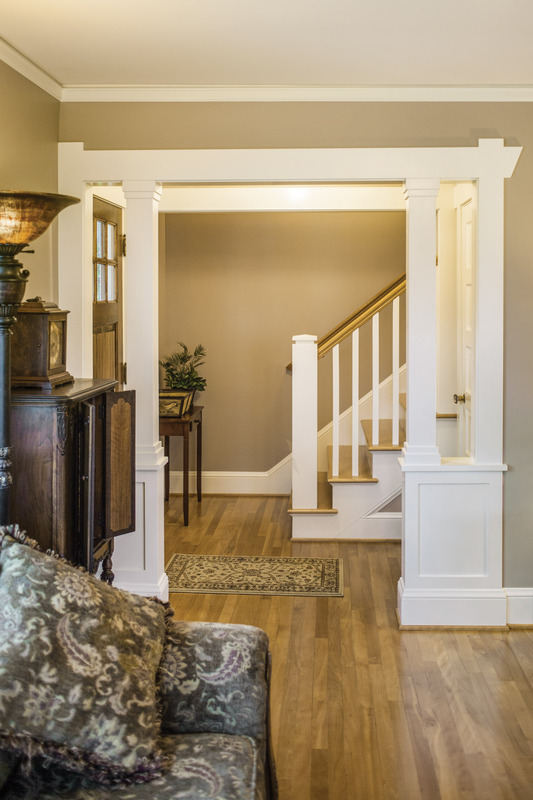 Wide archways between rooms create an early version of the open floor plan, making the small house feel spacious. As in many original bungalows, the kitchen was badly laid out, with multiple intrusions and poor access to the rest of the house. 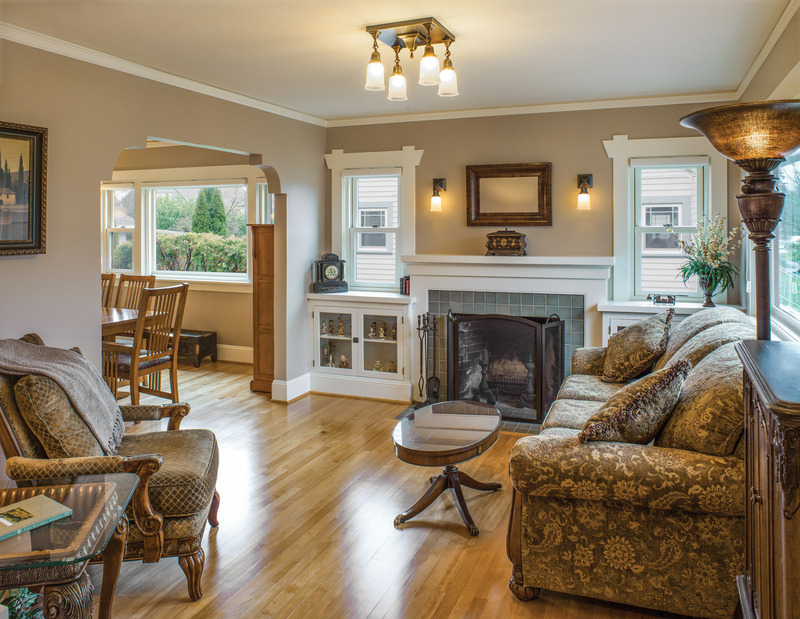 The McCullochs requested a more open floor plan that included a master bedroom with bathroom access on the ground floor, a downstairs sitting room, and a better connection between the kitchen and dining room. 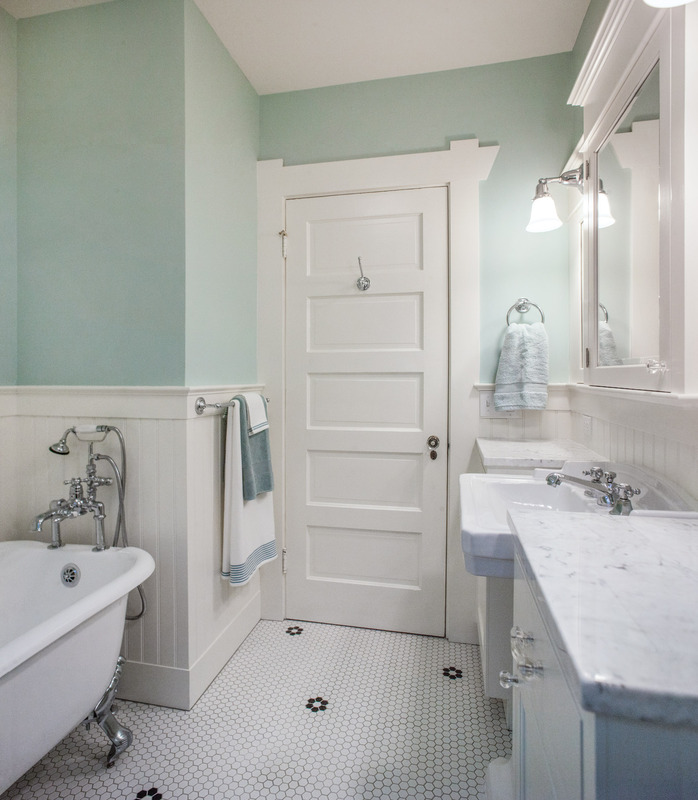 The five-panel door, a clawfoot tub, and a mosaic hex-tile floor with black “daisies” reflect the era when this house was built. Cabinets flanking the sink provide storage and countertop surface. Once common in bungalows of the 1920s, the through- tenon detail at the head of the casing now crowns doors and windows throughout the house, as well as the colonnade in the living room. Although the colonnade looks like a period piece, it is new, as is the entry foyer. Previously, the front door opened directly into the living room, practically hitting the door to an enclosed staircase on one side. The old house retained cues for its restoration, including the simple but handsome dining-room buffet and a remnant of the bold trim around doors and windows. Moving the living room wall just a few feet inward permitted enough space for a small foyer plus the colonnade, adding a sense of openness in less than 40 square feet. There was even enough room to carve out two new closets: one in the foyer, and one directly behind it that opens into what is now the downstairs master bedroom. Freitag’s team also took cues from the last surviving built-in, the dining room’s buffet, to replace the long-gone mantel, which is attractively trimmed with period-look tile. New bookcases were built in on each side of the fireplace. 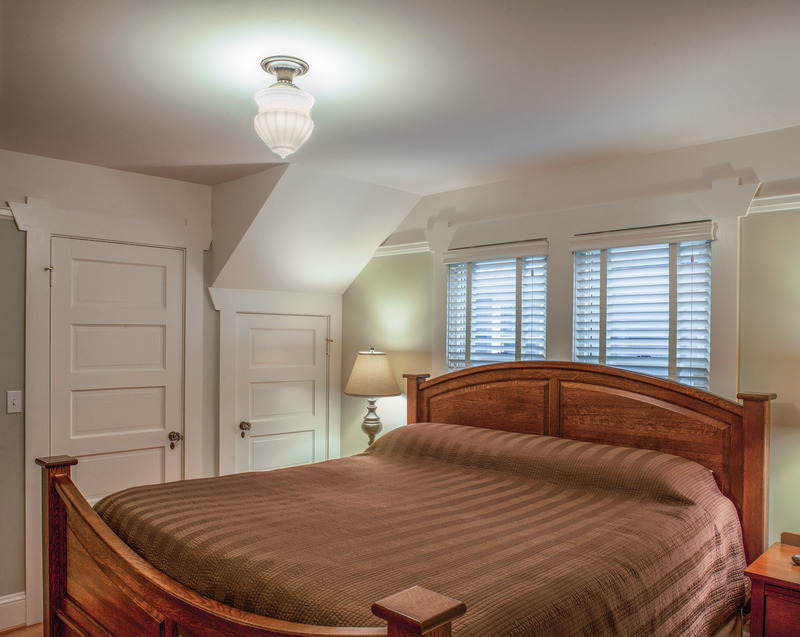 Now with a closet and direct access to the restored bathroom, the master bedroom sits conveniently on the first floor. Surprisingly, the McCullochs got everything on their wish list without expanding the house’s original footprint. There’s even a tiny bathroom now between two existing upstairs bedrooms. Now enjoying their forever house, Scott and Tracey say they actually reveled in the renovation process. “We feel so much more connected to this house now,” says Scott. 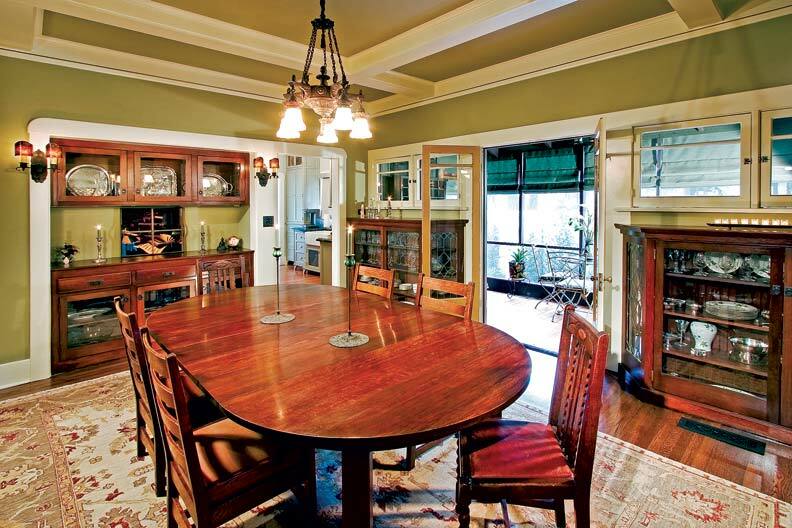 Another stepped arch ties the period-inspired kitchen to the 1920s house. 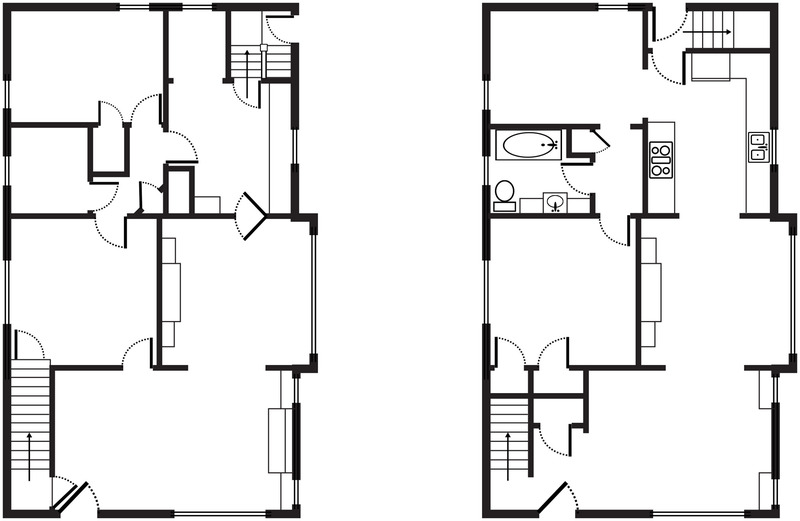 Kitchen floor plan before (left) and after (right). Though roomy, the kitchen was cut off from the dining room and compromised by multiple entrances and exits. A stairway to the outdoors had been crammed into a corner. Eliminating the staircase provided a space just deep enough to create an alcove for a new refrigerator. Opening up a passageway where the old fridge stood connected the kitchen to what’s now a sitting room. As a bonus, moving the fridge added precious inches of space for the bank of cabinets along that wall. A faithful re-creation of the 1920s stepped arch opened up the kitchen. 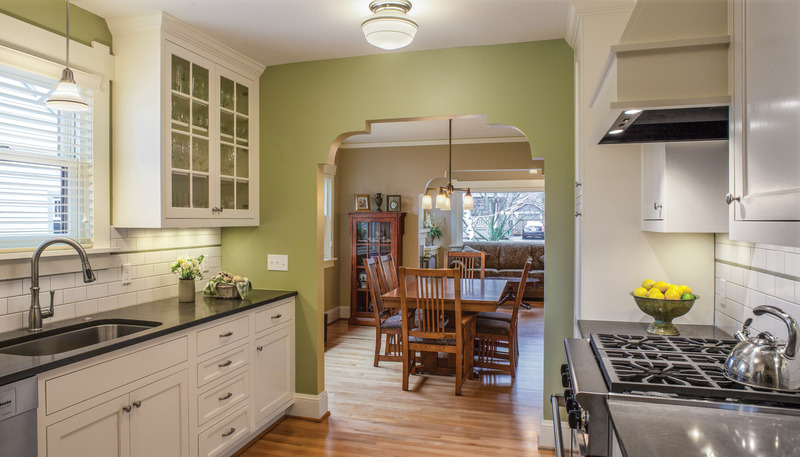 The opposite wall space is finished with new, period-appropriate cabinets and stylish, functional appliances. The new sink retains its proper place centered below a window. Perhaps the best part of the kitchen is the new arched passageway opening into the dining room. Carefully modeled on the surviving one in the living room, the new arch looks absolutely original to the house.